Dr. Kimberly Nguyen Stuckey is a family-oriented eye care professional, with 11 years, and counting, of experience helping people obtain and maintain their best eyesight. Dr. Stuckey holds a B.Sc in biomedical sciences from Grand Valley State University, and a Doctor of Optometry from The Ohio State University. She is a member of both the Ohio Optometric Association and American Optometric Association, and she specializes in general eye care. Dr. Stuckey grew up as a first generation daughter of Vietnamese immigrants, and wasn’t even able to speak English to her schoolmates when she first started in Kindergarden. Thankfully, the school pulled her out for ESL on a daily basis, and she soon learned the language. She grew up in Okemos, MI, and lived there until she left for undergraduate college at Grand Valley State University in Allendale, MI, and then went to Columbus, OH to attend optometry school at The Ohio State University. She chose to enter Optometry because she knew she wanted to be in the medical field, but also wanted to choose a profession that would allow her time to be a mommy as well. She had it narrowed down to optometry and dentistry, when, during her human cadaver lab, she held an eyeball in her hand and was amazed by how something so small was responsible for so much of our lives! Her decision was made then and there! Outside of work Dr. Stuckey enjoys going to musical theater shows, scrapbooking, reading and spending quality time with her friends and family. She also likes to dabble in photography and party planning. She’s been married to her husband, Chad, since 2008, and has three kids, Rylie (age 5, girl), Peyton (age 4, boy,) and Avery (girl, age 2). 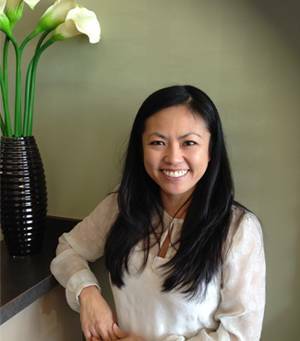 She is fluent in Vietnamese, and is happy to conduct eye exams for the Vietnamese community.